Art & Arcana: A Visual History is a huge, gorgeous compendium of what helps make Dungeons &Dragons so wonderful. Leafing through it brings up so many memories that I can’t gush adequately about it. The art is all so familiar, evoking the glorious campaigns our DM ran, the several editions I played, and the characters I created. I recognized the covers of the paperbacks my friends and I read, and the box art for the coveted miniature sets which I still have, and still use. This is not merely a coffee-table art book. Art & Arcana fully lives up to its subtitle as a rich and thorough history of Dungeons & Dragons. 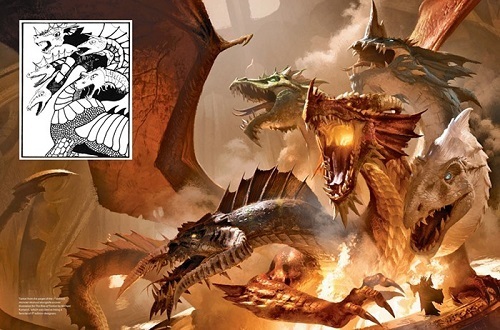 Interspersed with and guided by the lavish artwork is the narrative of the rise and fall of Gary Gygax and TSR and the game’s renewal under Wizards of the Coast. 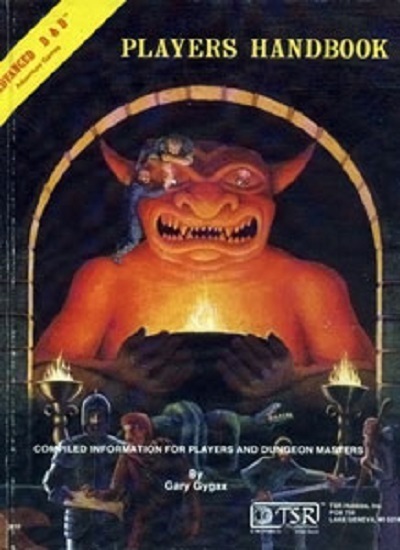 Art & Arcana incorporates the several attempts to portray D&D as some sort of Satanic cult into its history, and the changes made to the game’s art and advertising in order to counter those smears. This leads into the many attempts TSR made to branch out into the mainstream. 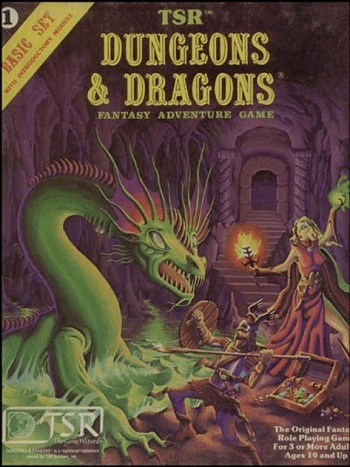 D&D was adapted into handheld electronics in the early 1980s, with all the wonders of that era’s graphics. Somewhat more sophisticated computer versions followed in the late 80’s. 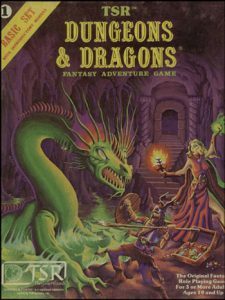 Along the way, Dungeons & Dragons ventured into records, candy, coloring books, Viewmaster slides, Colorforms, a Saturday morning cartoon that spawned a board game, and even a pinball machine. Of course Art & Arcana is thick with profiles of the artists, from the early, often teen-aged illustrators to the professional artists TSR and later companies eventually hired as D&D grew. Some examples of my favorites include Erol Otus and his classic cover of the original Dieties & Demigods; Clyde Caldwell’s iconic original art for 1983’s Ravenloft; and Darlene’s epic map of Greyhawk. 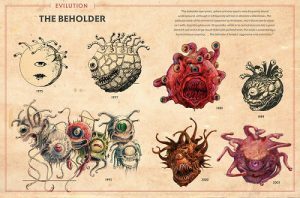 In addition to the instantly-recognized classic art, the beautifully realized D&D variations found in Dragonlance, Forgotten Realms, Pathfinder, and Spelljammer are all included here as well. The development of the classic sets and modules, and how the maps and character sheets became refined over time, are explained as well. Two-page spreads detail the changes in how orcs, dragons, beholders, mindflayers, and other terrible beasts were drawn over the years, from the amateurish early versions to the vivid, polished monsters of today. Even the influence of the indispensable miniature is covered, from the first cheap plastic monsters to the original MiniFigs and Grenadier figures, and on to TSR’s own official Advanced Dungeons & Dragons figures. There is nothing about how hard it is to paint the eyes, though. Authors Michael Witwer, Kyle Newman, Jon Peterson, and Sam Witwer have done a spectacular job of showing the history of Dungeons & Dragons in all its colorful glory. Anyone who has played any of the editions or variations will find something in Art & Arcana to reminisce over. It is a beautiful book that I will be going back to, over and over again.